This week, Premier Wade MacLaughlan of Prince Edward Island and Premier Jim Prentice of Alberta joined Prime Minister Stephen Harper, Premier Kathleen Wynne, and former Premier Pauline Marois as the four and fifth first ministers, respectively, in exposing the futility of Canada’s model of fixed-date election law, which preserves the Crown’s authority over dissolution. These five first ministers all advised and received early dissolutions when their governments still possessed the confidence of their assemblies. Harper, Marois, and Wynne headed single-party minority governments in hung parliaments. But MacLaughlan and Prentice have broken new ground: both were appointed as premiers mid-parliament, both lead single-party majority governments, and both advised early dissolution of majority parliaments within a few months of their appointment in order to “seek their own mandates”, as the saying goes, and consolidate their own political power over their parties, cabinets, and the legislative assemblies of their provinces. In effect, MacLaughlan and Prentice have adhered to the principle contained in Newfoundland & Labrador’s unique fixed-date election law, which requires a new premier appointed mid-parliament to advise early dissolution under some circumstances, as described here. On 13 November 2014, Robert Ghiz announced that he planned to resign as both Leader of the Liberal Party and Premier of Prince Edward Island as soon as the party selected his successor. Unlike Premier Redford of Alberta and Premier Dunderdale of Newfoundland & Labrador, Ghiz seems to have left on his own accord; rather than resigning abruptly and forcing the party to select an interim leader, Ghiz stayed on during the transition. 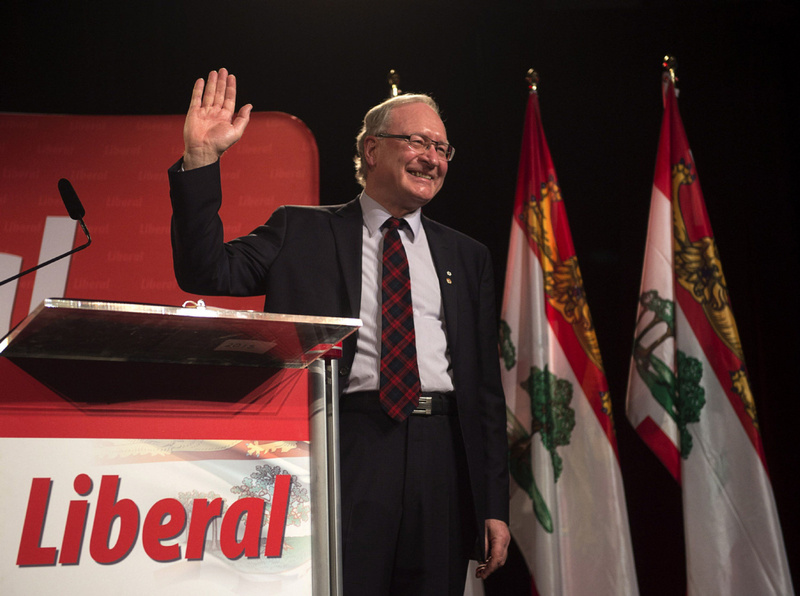 The Liberal Party of Prince Edward Island acclaimed Wade MacLaughlan as leader on 21 February 2015. The Lieutenant Governor then appointed him as Premier on 23 February 2015. MacLaughlan in turn advised his superior to dissolve the legislature and issue writs for a “long-expected spring election” on 6 April 2015. The Guardian, the Island’s main newspaper, didn’t seem to object to the early election. The CBC reported nonchalantly that MacLaughlan had decided not to abide by the fixed calendar – but I hesitate to call its tone “matter of fact” because the following passage contains some curious factual errors. Fixed election-date legislation had set the next provincial election for Oct. 5, but an earlier date comes as no surprise. A spring election call was set up when Robert Ghiz announced his resignation as premier in November, pending the selection of a new Liberal leader. MacLauchlan was named leader on Feb. 21 and sworn in as premier two days later. Few expected he would wait until October to attempt to win his own mandate. Originally, Prince Edward Island’s next general election was scheduled to take place in October 2015. However, the Legislature of Prince Edward Island passed an amendment to its fixed-date elections law in 2014 that would delay the scheduled provincial general election from October to the following April if a federal general election were also scheduled for October. PEI’s legislature thus passed a law similar to those of Manitoba and Saskatchewan, which were also designed to prevent a federal general election and provincial general election from ever coinciding or overlapping. Since the next federal general election is still scheduled for October 2015, Prince Edward Island is holding its provincial general election fully one year earlier than scheduled and not 6 months in advance! There could be a new leader who gets elected a says: ‘I’m challenging that […] the current Premier to an election right now.’ I have the prerogative to say: ‘There’s a new leader in place, and they want to go to the polls, we want to go to the polls.’ I’ll go see the Lieutenant Governor. MacLaughlan kept his options open as well. Premier Jim Prentice surprised no one by advising the Lieutenant Governor to dissolve the 28th Legislature on 7 April 2015. He wasn’t exactly subtle in the lead up; the previous evening, he even issued a press release that he would make a “major announcement” the following morning. In fact, Premier Jim Prentice had been preparing himself for the last few months to advise an early dissolution so that he can obtain a mandate from Albertans on his government’s upcoming budget. More generally, Prentice will also seek a mandate for himself because the Lieutenant Governor appointed him mid-parliament after a furore surrounding Premier Redford. Fixed election-date legislation had set the next provincial election to be held no later than the spring of 2016, but an earlier date comes as no surprise. Over the past weeks, Prentice has continued to say he needed a mandate to put this year’s budget into action. In terms of the media coverage, journalists have demonstrated yet again their new-found acceptance and acknowledged of the fact that the Canadian model of fixed-date election laws preserves the Crown’s authority over dissolution. However, I suspect that it would suddenly evapourate if Prime Minister Harper advised the Governor General to dissolve this 41st Parliament early. In reality, all the Canadian fixed-date election laws preserve the established constitutional positions of the Governor and First Minister. They preserve the Governors’ authority to dissolve the legislature earlier than the date of the next scheduled election cycle and thereby also preserve the First Minister’s authority to advise that early dissolution. The law cannot drive a wedge between the Governor and First Minister. The law cannot limit the authority of the First Minister without also necessarily limiting the authority of the Governor, because the First Minister derives his authority as First Minister, i.e., role of the Crown’s primary constitutional adviser, by virtue of the Governor’s commission of appointment and confidence in him. In other words, the office of premier derives its authority and existence from the Crown, and the First Minister and Cabinet, the Ministry, exercise their executive authority in the name of and on behalf of the Crown. The office of premier only exists by uncodified convention because the Crown exists under the codified Constitution Acts. Only a constitutional amendment passed pursuant to section 41(a) of the Constitution Act, 1982 – the unanimity formula – could eliminate the Crown’s authority over dissolution and create true fixed-term parliaments. And this is precisely why all the Canadian fixed-date election laws incorporate non-derogation clauses that preserve the Crown’s authority over dissolution. As such, the fixed-date election laws have succeeded only in limiting the maximum life of the legislature from five years to four years — except in Manitoba, Saskatchewan, and Prince Edward Island, where the legislature would last four and one-half years under some circumstances. The Constitution Act sets the maximum at five years, but a statute law can exceed the baseline standard established in a constitutional provision; in this case, exceeding the baseline means shortening the life of the legislature. Under Responsible Government, ministers of the crown take responsibility for all acts of the Crown, which includes dissolution and drawing up the writs of election. As Forsey and Eglington showed, Responsible Government is a “trinity – three responsibilities in one.” The First Minister must maintain the confidence of the Governor, which the latter gives by appointing the former and continuing to implement his constitutional advice. In addition, the Ministry must establish and maintain the confidence of the assembly and maintain solidarity within itself (collective ministerial responsibility), and each individual Minister takes responsibility for his own portfolio (individual ministerial responsibility). The Governor does possess the authority to reject a First Minister’s advice to dissolve the legislature. However, if the Governor rejects such constitutional advice, he thereby either dismisses the First Minister, or forces him to withdraw his advice (which is difficult in the case of dissolution), by withdrawing his confidence and commission of authority to govern from him. A First Minister can only take responsibility for advice that he tendered to the Governor, not the opposite of that advice. The Governor’s first duty is to ensure that there is always a duly-constituted government in office because Her Majesty’s Government and business must carry on; therefore, if the Governor dismisses one First Minister and ministry, he has to appoint a new First Minister and ministry which will accept responsibility for his dismissal of their predecessors and refusal to dissolve the legislature. But in a majority parliament, the Governor is bound to accept the advice of a First Minister to dissolve the legislature early because there is no alternative government that could take responsibility for the Governor’s dismissal of the First Minister who tendered that advice of early dissolution and a new general election. Such was the case in both Prince Edward Island and Alberta, where the MacLaughlan government and the Prentice government, respectively, both commanded overwhelming parliamentary majorities. MacLaughlan and Prentice raise another interesting question: should premiers appointed mid-parliament “seek their own mandates” through early dissolution? Is there something intrinsically “democratic” about this endeavour? I would say not in these cases. Sometimes early dissolution is justified, but there is nothing at all exceptional about a premier or prime minister appointed mid-parliament – in fact, it is the necessary standard operating procedure for most intra-party transfers of power from one ministry to another. Only when another party or coalition of parties wins a parliamentary majority in the general election does the inter-party transfer of power takes place outside the life of a parliament. Both Alberta and Prince Edward Island were scheduled to hold their next general elections in the spring of 2016, only one year from now, both the MacLaughlan and Prentice governments were supported overwhelming parliamentary majorities, both governing parties would probably win a general election whether it were held now or one year from now – and holding general elections has become increasingly more expensive. One recent counter-example to MacLaughlan and Prentice is Premier Christie Clark. In British Columbia, the Lieutenant Governor appointed Christie Clark as premier on 14 March 2011 mid-parliament; the next scheduled general election took place in May 2013, as planned. Contrary to all expectation and public opinion polling at the time, Clark led the BC Liberals to a parliamentary majority and thus “won her own mandate,” but without incurring additional cost to the treasury. This is reasonable and sensible. After all, in a parliamentary system, we elect members, not prime ministers. CBC News, “PEI Premier Robert Ghiz Announces Resignation,” 13 November 2014 [accessed 8 April 2015]. CBC News, “Wade MacLaughlan Confirmed as P.E.I. Liberal Leader,” 21 February 2015. [accessed 8 April 2015]. CBC News, “P.E.I. Election Called for May 4: Premier Wade MacLaughlan Calls Long-Expected Spring Election,” 6 April 2015 [accessed 8 April 2015]. The Guardian, “Election Buzz Rife in Prince Edward Island,” 6 April 2015; The Guardian, “It’s Official: Islanders Go to the Polls May 4th,” 6 April 2015. Premier Robert Ghiz, [“Orders of the Day (Government)”] in Prince Edward Island, Legislative Assembly. Hansard, 64th General Assembly, 4th Session, 4 April 2014 (Charlottetown, Prince Edward Island Legislative Assembly, 2014), 1013. CBC News, “Alberta Election 2015: Ballots to Be Cast on May 5th,” 7 April 2015. Karen Kleiss and Mariam Ibrahim, “Alberta Kicks Off Campaign After Early Election Call: We Go To Polls May 5th,” Edmonton Journal, 8 April 2015. Forsey and Eglington 1985, 18-19.